Kristaps Porzingis had to miss just two games after the ankle injury he suffered against Miami and his absence was felt. The Knicks lost both as they were also shortened by the stress injury of Tim Hardaway Jr.
After starting 15 times last season, Lance Thomas was inserted into the starting lineup for the first time this season by coach Jeff Hornacek for his defensive presence and the impact was huge. 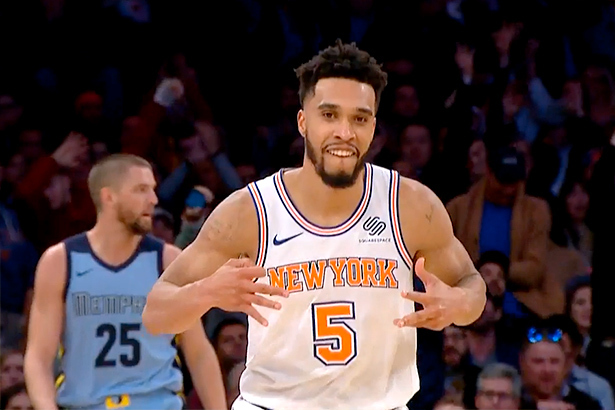 Thomas scored only 8 points – including a four point plate early in the game – but was a decisive factor alongside Courtney Lee in Knicks’ comeback style 88-99 win over the Memphis Grizzlies. Offensively speaking, the Grizzlies had the upper hand in the first quarter when they took a 9 point lead, led by an effective Chandler Parsons, who scored 10 of his total 13 points in the first act. But the Knicks bounced back in the second quarter and outscored Memphis 17-26 to tie the game, 49-49 at halftime. As the second half began, New York dominated their opponents and after grabbing a 17 point lead, they never let go. The Grizzlies attempted a comeback in the fourth quarter when they trimmed the lead down to six points but the reply was quick as Courtney Lee and Kristaps Porzingis put the Knicks back in double digits and sealed the game. Lee finished with a game-high 24 points after being moved back to the shooting guard position and shot 10-17 from the field; Porzingis followed with 18 while Enes Kanter and Jarret Jack finished both in double-doubles. Kanter scored 12 points and grabbed 12 rebounds while Jack nailed 10 and dished 10 assists. Michael Beasley was another offensive force off the bench, finishing with 14 points and a plus- of 19. Frank Ntilikina combined 8 points, 3 steals and 2 assists in 21 minutes of playtime. For the Grizzlies, Marc Gasol had 17 points and 8 boards. Memphis ended on Monday an 11 game losing streak with a 95-92 win over the Minnesota Timberwolves and now dropped to 8-16. New York bounced back at .500 and on Saturday night they will take on the Bulls, in a new road game.